Spin This: "Last Night in the City," "Pressure Off," "Butterfly Girl"
Avant-garde boy band Duran Duran has gone through almost every change in the book: shedding their early New Romantic sound for New wave synthpop, working alongside Chic powerhouse Nile Rodgers, censored art and state-of-the-art music vids; house and more urban-chiseled works. 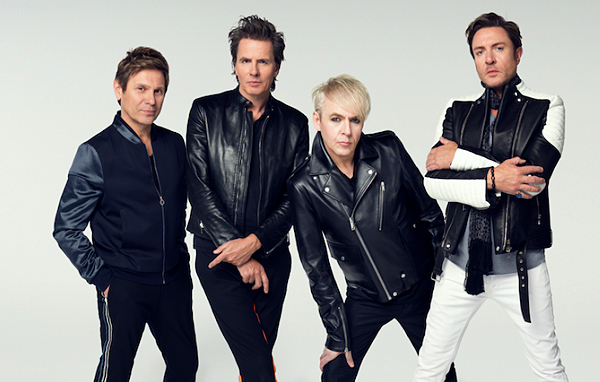 After reuniting the classic lineup in the early 2000s and breaking out with 2010’s All You Need Is Now, their best LP since Rio, Duran Duran finally drops a follow-up. Returning alongside it-hitmaker Mark Ronson (who shepherded the success on All You Need Is Now), the grown-up boys rushes into dreamy New Wave explorations, ambient string arrangements (“What Are the Chances?”), but mostly piggybacks on what All You Need Is Now accomplished. “Last Night in the City” follows the girl featured trend used “Safe (In the Heat of the Moment)” by employing trend vocalist Kiesza. It’s also more arena bound instead of sounding like a mere dancefloor offering. That probably explains what’s most different on Paper Gods. The sound is more massive and big stage focused. It sounds like Duran Duran with more of a Coldplay production value. “Butterfly Girl” also gets two thumbs up for dropping intoxicating beats emulating LCD Soundsystem’s “Get Innocuous!” on the opening, but the band’s catchy songwriting skill shines above the comfort zone of Ronson’s earful of nostalgia. Also important to the organization of Paper Gods is the inclusion of Rodgers, the mastermind behind the mix of the band’s Eighties jam “Notorious.” The Chic whiz jumps in to give the disc a solid display of splashy funk and even nails a few co-production credits. 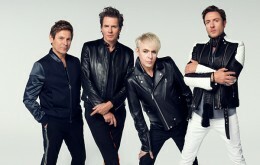 On “Pressure Off,” furious synths and Rodgers’ recognizable guitar riffs overtake the presentation, even as Janelle Monáe is often camouflaged in the background with Simon Le Bon. 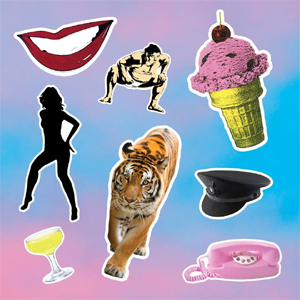 The buoyant chorus (“Oh, oh, it’s up to you now/It’s time to take the pressure off”) is fitting with Duran Duran’s proudest career moments, easily becoming one of the album’s strongest moments. Rodgers also drops in on “Only in Dreams” and the razor-sharp synthpop of “Change the Skyline,” an exceptional track exposing remnants of chunky Eurodisco. The disc is overtly uptempo, hardly slowing down the neurotic pace. Only one ballad enters the fray: “What Are the Chances?” walks the line of adult contemporary by blending rapturous strings and U2-esque guitar wails set by Red Hot Chili Pepper alum John Frusciante with warm melodic touches. Not everything on Paper Gods sound like it’s written with a stroke of prolific majesty. We’re still trying to decipher why Lindsey Lohan is even featured on “Danceophobia,” where she’s reduced to girl talk narrations midway into the performance. “You Kill Me With Silence” sounds awkwardly whimsical as it teases a soundscape that seem like a forced mash up of Coolio’s “Gangsta’s Paradise” and Mike Oldfield’s “Tubular Bells.” But with Ronson’s pulse on ticklish pop and funk, the band pulls off a satisfying follow-up to All You Need Is Now without going down the per usual copy-and-paste route. This disc mostly compliments their dancey tradition without merely duplicating their better stuff.